Saskatoon-based entrepreneur Katherine Regnier is one of Saskatchewan’s success stories when it comes to its technology sector. Yet the chief executive officer and founder of Coconut Software recounts a story shared by many entrepreneurs in the province who have travelled to California’s Silicon Valley seeking funding. “It’s understandable because starting a software company in Saskatchewan really hasn’t been a thing,” says Regnier, whose company provides cloud-based appointment scheduling software for clients that include Rogers, Telus and American tax preparation company Jackson Hewitt. While the Prairie province is a global player in agriculture, oil and gas and mining, its tech sector has been, for the most part, flying under the radar. But that is changing. Over the past few years, successful companies have emerged — such as Coconut Software, iQmetrix, Vendasta Technologies, GasBuddy and 7shifts. One thing that was missing, though, was a tech hub — sometimes called an incubator — that helps nurture fledgling entrepreneurs with bright tech ideas. That’s why the province and other industry stakeholders came together last year to launch Co.Labs — a 5,500-square-foot tech incubator located at Innovation Place in Saskatoon, adjacent to the University of Saskatchewan. Co.Labs now links the dots, providing a foundation for growth for the province’s young tech startups. It’s a framework that both Dutchak and Regnier say has been sorely needed in Saskatchewan. Dutchak himself has launched a few startups — and not all of them successful. In fact, he spent months in his garage developing 3D printing technology for the health-care system. It was a great technology, but it wasn’t a great business idea, he says. And so he spent time trying to build a business that had no future. Had he had access to Co.Labs, he says he likely would have realized much sooner his idea wasn’t viable — saving himself a lot of time, effort and money. 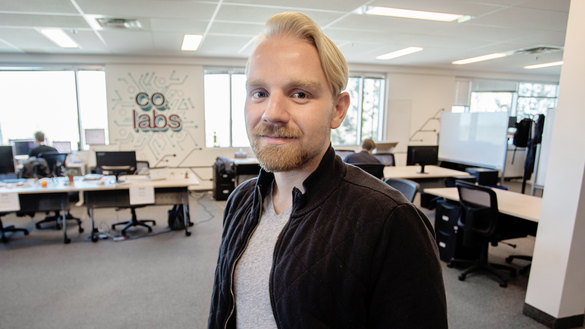 Although located in Saskatoon, Co.Labs is a resource for tech startups and founders across the province, including a number in Regina and Moose Jaw. Approximately 15 companies are physically located in the incubator at Innovation Place in Saskatoon and in their first 12 months of operations they have supported over 37 startups across the province. Regardless of where they are, Co.Labs has already made a tangible difference, helping startups raise more than $3 million in angel investment in 2017. That’s just the start, Dutchak adds. Besides capital, Co.Labs offers entrepreneurs other essential help, including mentorship from established local entrepreneurs and expats working for some of the world’s foremost tech firms. Among them is Steve Woods, originally from Melfort, Sask., and now Google Canada’s chief engineer, based in Waterloo, Ont. Mentors are essential to help startups grow, but Dutchak says would-be tech-preneurs would have trouble accessing mentors’ expertise without an incubator like Co.Labs. “When you’re in the trenches trying to build your company, you have little time or incentive to find a support group and mentors on your own because you’re in the thick of it, trying to figure out how to generate revenue,” he says. Co.Labs is that plug-in point for startups to access mentors with national and even global reach. It also helps build a vibrant and supportive ecosystem such that entrepreneurs don’t feel they must move to larger centres to get their ideas off the ground. After all, Regnier says Saskatchewan has plenty to offer that much larger centres — like Silicon Valley — can’t.